A sampling of the prototypes that are modeled on the layout. 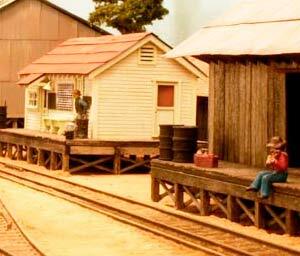 The idea is that the layout borrows signature scenes from a variety of railroads that ran in California. Rather than sticking with one line, I decided I could get more of what I like in a layout by combining various roads. I chose California west coast railroads as my prototypes.. I am trying to keep high modeling standards and am modeling specific places from each line, complete with signature structures and scenic elements. 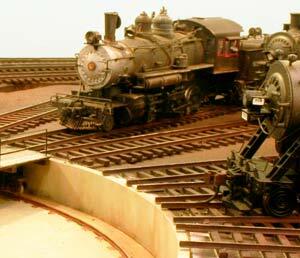 The approach of combining scenes from various railroads into a place that seems real, but never existed coupled with prototype scenes modeled to high standards is known in the hobby as "Protolance". While making allowances for artistic licence, all structures and scenic elements draw on the prototypes listed below depending on location on the layout. Locomotive and caboose rosters also reflect these prototypes. In general, rolling stock from any west coast or nearby short line from the steam era will be utilized. My protolance approach differs from the freelance style in that I am basing my layout on specific prototypes. Protolance differs from strict prototype modeling in that I am combining various prototype scenes and rolling stock ways that didn't’ exist in real life. 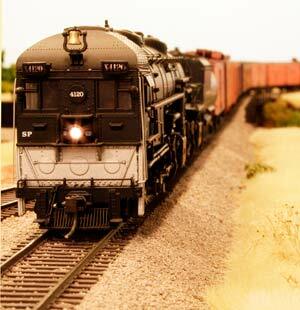 Southern Pacific: West coast steam era. Modesto and the Valley was home to the one of the SP mainlines. 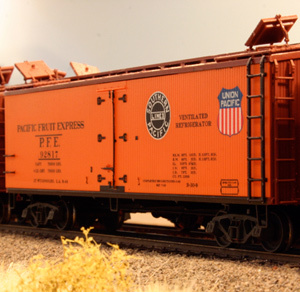 Bottom deck uses cab forwards and feature the SP’s classic reefer block trains. SP water tanks, spouts, oil cranes, signals and general practices in terms of scenic/right of way items are used on the mainline around the bottom deck. Rolling stock is limited to mid 1950”s and earlier. Western Pacific/Tidewater Southern: Ran up the valley between Stockton and Turlock passing through Modesto. The Tidewater Southern was Branch of the Western Pacific that had track running through Modesto in the middle of 9th street. Ninth street is modeled with some canneries and other industries that were situated along the right of way. Sierra Railroad: Still runs from Oakdale to Jamestown and Sonora. The Hetch Hetchy had a junction with the Sierra that is modeled on the second deck. The Jamestown turntable is at Willoughby Yard. 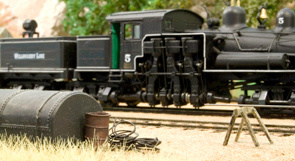 Sierra Rolling stock is used heavily on the layout including cabooses, WSM 2-8-0 #24 and the famous #38 articulated (when the shop crew gets around to re-motoring and decoderzing it). Hetch Hetchy Railroad: Built by SF to construct the O” Shaughnessy Dam in the Hetch hetchy Valley in Yosemite National Park. The railroad interchanged with the Sierra and ran 50+ miles through Groveland and Mather up to the dam site. It was shut down after the last dam construction in the late 1930’s Track lasted into the 1940s. The layout has the Junction, Incline, Mather and Groveland scenes. 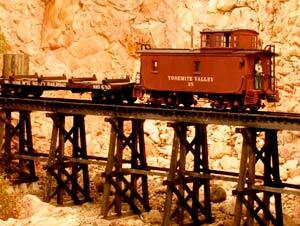 Yosemite Valley Railroad: Ran from Merced to El Portal through the Merced river canyon. Layout features the Mountain King mine and a bridge from the YV as well as a variety of rolling stock including the some cabooses and log bunks. 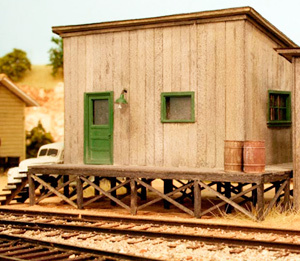 Among the YV structures on the layout are the Merced Round House, the Mountain King Mill and the El Portal turntable. Cool References: Trains to Yosemite by Jack Burgess, Jack's YV WebsIte. Great modeling info. West Side Railroad: Narrow gauge from Standard on the Sierra line out into the woods. Operational into the 1960’s. A small Westside area featuring dual gauge track work and buildings is included in the Groveland scene.